We invite you to explore India - the Land with infinite beauty ! Whether you soar high into Himalayas or peer under the ruins of the Ancient monuments dotting the landscape of India, you will cherish the experience long after your visit ! 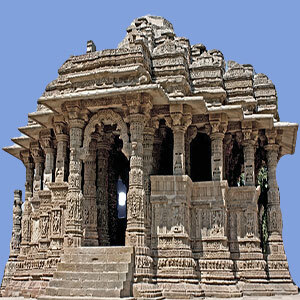 This India Travel Guide on Sun Temple Modhera is free from any commercial interest! This site is dedicated to promote India - the vast subcontinent, its glorious past, magnificent landscape and its infinite variety. An architectural legacy of the Solanki rule, the Sun temple at Modhera is set alongside the River Pushpavathi. The Solanki period was known as the Golden age of Gujarat. The drive to the Sun Temple is picturesque, with verdant farmlands and temples. Modhera is about 25 km from Mehsana and nearly 100 km from Ahmedabad. You are sure to be captivated by the serene surroundings and the energy radiation from the sun temple. This temple was built and dedicated to the Lord of life and light, the Sun God. This temple was constructed by King Bhimdev I in 1027 AD. The kund or the ceremonial tank is one of its kind. This temple idols were made by the Silavats, who were popular as temple engineers. Their expertise in idol making is evident here. The temple was built in accordance with Vaastu Shastra. Each of the stone carvings speaks a language of its own; depicting numerous impressions ranging from flora and fauna to narrative art and legends. Kund: When you enter the temple complex, you see the rectangular kund or tank. It is known as the Ramakund and encompasses 108 shrines dedicated to various gods. The kund is a fine example of a geometrical architecture. This tank dovetails seamlessly into the main temple structure. You can go down the stepwall from the eastern end; as the other sides are steep and form the wall shaft. Sabha mandap and Antaral: A flight of steps leads you to the sabha mandap or the assembly. This mandap is an assembly of twelve representations of Aditya in sculptural splendor. The twelve representations carved on the pillars represent the sun through the twelve months. Tourists interested in history and folklore can engage a priest who would enthrall you with tales and sequences from epics and legends. The epics and legends are carved on the 52 pillars in the temple section. The carved murals serve as a virtual encyclopedia of history of communities, and also describe fairs and festivals and rituals of the golden era. Garbagruha: The sharp rays of the sun illuminate the inner core of the Garbagruha. The Garbagruha was designed to allow the rays of the rising and setting sun during equinox (20 March and 21 September) fall on the ornamented sun God's idol. The golden idol was ransacked by Mohammed Gazni. The exterior wall - the exterior wall of the temple has 12 different posture of Aditya (the Sun God). The Modhera dance festival depicts the ancient history and rich cultural tradition of the region. The festival is scheduled during the third week of January every year. The festival is held after Uttarayan for three days against the backdrop of the Sun temple. The Modhera dance festival showcases traditional dance forms against a grandiose backdrop. The festival is organized by the Tourism Corporation of Gujarat Limited (TCGL) to celebrate various performing arts in the country.